Give him a high school ring with both style and substance. The newest Freestyle class ring from Limoges features 4 brilliant round CZs placed in a setting of gleaming yellow CELEBRIUM. CZs total .71 cttw.Personalize the top with graduation year. Add name, school name or activity to the sides of the solid band, the choice is yours. Up to 10 letters on top left side and bottom right side of band. For a truly personalized touch, add an engraved message on the inside of the band, up to 10 letters & spaces.Limoges Jewelry is proud to offer CELEBRIUM -- an innovative, affordable metal alloy noted for its lasting shine and durability. Better than expected! Just one disappointing thing. 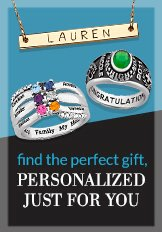 My only problem or more of a disappointment is the fact that the ring on the site shows the letters in black and the ring I ordered the letters are not! I think the website needs to say that the letters are not colored when received, it is kind of a deception in what you are getting, if not for that I would give 5 stars! Plus this ring picture makes it look light yellow and it really looks for like gold actuality, very nice. Engraving is nice but letters are smaller than expected. Overall Super!!! Definitely will order from here again! Just hope they fix their website contact us email, no good!